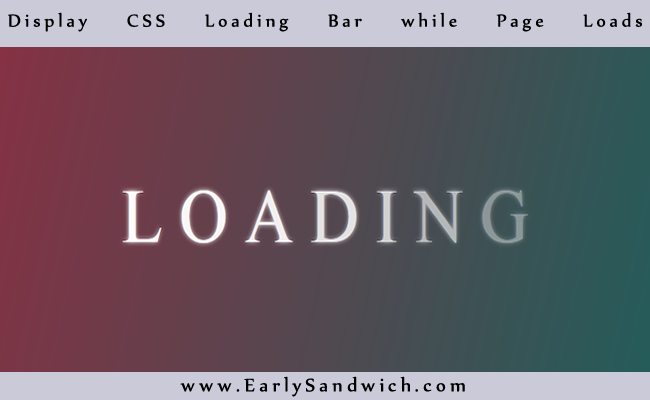 First we are going to create a Loading bar with HTML and CSS3 keyframes. Here we have a div tag with id=box. And every character in Loading word is wrapped with a span tag. Now lets apply styling to Loading Bar. I will describe .word:nth-child(1) CSS rule for better understanding. Fade means we applied fading effect to animation. 4s is animation duration. Infinite is animation iteration count which specifies the number of times animation will be played. 200ms is animation delay. Include jQuery Library into any page where this code will be used. The whole page content will be placed in this section.